Just a few weeks ago (Issue 20), India was saved from the hell that the beautiful Philippines have now become – excellent evacuation measures and timely response prevented Super Cyclone Phailin from becoming the disaster it could have. But not so in the island nation. Last week, the massive Typhoon Haiyan, or Yolando as they call it there, a storm that dwarfed even the mighty Phailin, caused untold obliteration and devastation – leaving thousands dead and millions displaced. It recorded the highest sustained wind speeds ever for any cyclone in recorded history – sustaining speeds of 315 km/h for over a minute. And that’s sustained speeds – the maximum speeds reached an unbelievable 380 km/h – higher than Katrina, Sandy – anything you name, it’s the most intense cyclone to ever hit land. And this superpower struck Samar Island (in East Philippines) with full force on Friday the 8th, destroying the town of Tacloban and then continuing on to ravage through the rest of the Philippines’ islands (Leyte, Cebu being among the worst affected). The Filipinos, usually stoical and robust in the face of disaster – used to all the storms, hurricanes & tsunamis – were simply overwhelmed by the sheer magnitude and destruction of the super typhoon. Nearly 5,000 confirmed dead by the UN, and they’ve just started the search for the bodies – local workers have estimated numbers as high as 10,000. Red Cross reports over 22,000 missing – as of now. The number of injured we cannot even estimate – we know its in the tens of thousands. 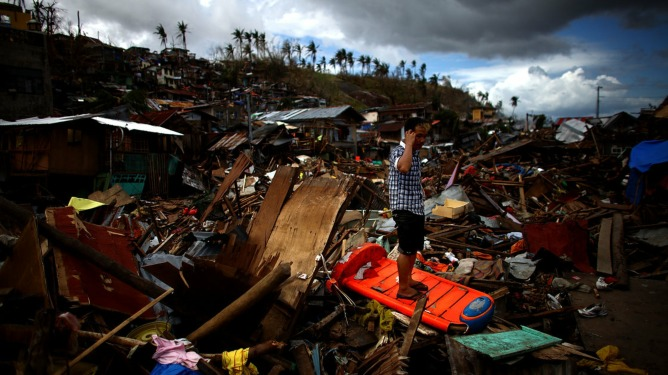 The damages are estimated at a massive $15bn – how is the tiny country going to cope with that. People are without food or shelter – to make matters worse, looting and crime has followed in badly affected towns, where law and order have broken down. Who can blame whom – desperate and hungry people will do desperate things. The disaster is probably the worst natural disaster of the year – although the death toll is still unconfirmed – estimates tell us it is the worst in the Philippines’ history. We sympathise with their plight, and also acknowledge the pathetic government response in preparations, evacuation, and, most of all, relief provision.